I need my intentional morning routine, because using my mornings well affects my entire day. If I wake up late and don't follow a plan, my whole day feels off and I don't get everything done that I need or want to. 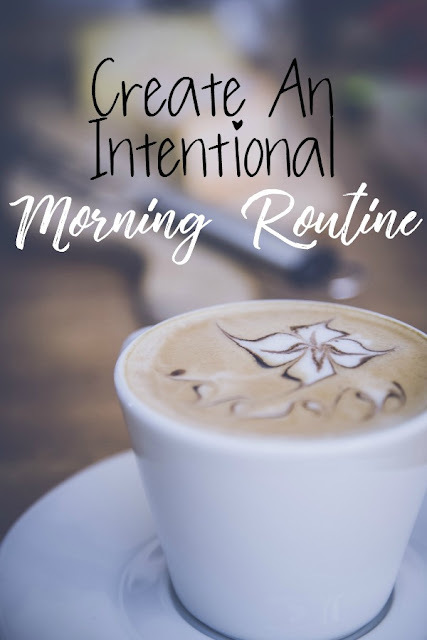 A morning routine gives you time and energy for the things that matter most, so I'm sharing not just my routine but also how you can set up an intentional morning routine yourself to help guide your day. Begin with changing the night before. Rushed and crazy mornings are a direct result of what's failing to get done the night before. If I'm almost late to work because I was wasting time cooking elaborate breakfasts from scratch, trying to find clean clothes, locating my keys, etc., it's not because work started any earlier - it's because I didn't plan ahead the night before. Tomorrow I'll have a longer post on creating an intentional evening routine, but for now, just the basic: take some time to think about what makes your mornings stressed and then think about how you can prepare for those things the night before and remove that stress from your morning routine. The most important thing is that you get enough sleep, so determine a wake up time and count back 8 or 9 hours. That's your bedtime. Aim to be in bed with electronics off by that time, so you have time to read a book and relax before falling asleep. Before you get to that bedtime though, think about 3 to 5 tasks that you could get done to have a more productive morning. How can you start the day moving forward, instead of backward and working on things that should have already been done? It shouldn't be a long and overwhelming list, just a couple of things that usually cause you trouble in the morning. These could include: setting out your clothes, cleaning the counters and starting the dishwasher, and making sure your bag is packed and by the door. Decide what key things you need to prioritize in your life right now. When I ran a blog survey a few months ago and asked what kinds of posts you want to see, people asked about routines, how I keep up with things, and how I do it all. That's the key though - I don't do it all. I've prioritized the key things, which are different for everyone. If your day always feels disorganized, it's probably because these key things are getting pushed down on the list or off it completely, since the day is getting filled with the smaller, less important stuff. Prioritizing the key things starts in the morning, because you run out of time and energy by the evening. Mornings should be for 'important, not urgent' tasks, so you're not starting off with stress. Determine 2 or 3 key things to get done in your day (think of it as 'what's the most important thing you need to accomplish today.') and build your routine around those things. Things not to prioritize first thing in the morning? Sorting mail, taking the trash out, checking e-mails. Creating a to do list. This is a tricky area for most. People seem to think they should write down everything and then systematically cross things off throughout the day, but then get frustrated when they get behind, even though they set themselves up to fail in the first place. Not the way to make a successful to do list. To make a better version of the to do list, start by making your list each evening or each morning of your task list for the day. Start with the most important things you just prioritized, then add the basics like laundry, showering, any activities, calling for a dentist appointment - the responsibilities that are absolutely necessary. Assign general time frames if that helps (like calling the dentist while on your lunch break.) And then shorten the list. Truly, no more than 5 to 10 things. You'll feel way less overwhelmed and you'll get better at saying no to things because you recognize your day is already full. Plus you actually get to complete your list, so you feel much more accomplished. If your list on any given day is just too long, ask yourself whether a task really needs to be done at all, whether it needs to be done that day, and if someone else can do it, if you just have to many things that all need to be done at once. So decide how you want to keep the list (I'm all digital), and then decide a time every day to make the list. I do mine before bed because I can get everything out of my brain and can sleep better. Think about diet and exercise. Generally, how well we feel in a day is pretty directly related to how we treat our bodies. If you don't get enough water, eat sugary breakfasts, and sit at a desk all day, it's really hard to feel energetic and productive. I keep breakfast super simple, with some sort of egg bake for John, and overnight oats for me. (Truth be told, I don't even like breakfast, I bring it to work to eat later in the day.) Keeping it simple, and prepared ahead of time, is key. I also have 32 oz mason jars of water in the fridge that we're both supposed to drink when we wake up. I'm better about that then John is. I keep exercise super simple too, 15 to 20 minutes each morning on the treadmill, unless Hawkeye is up for a faster, longer walk. I've incorporated it into my morning routine because there is absolutely 0 chance of me doing it after work, ever. Both of John's jobs are labor intensive so he doesn't need to do this in the morning, but he will lift weights when he's feeling like it. Eliminate decision fatigue. 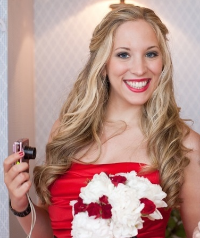 Thinking about adding in exercise and healthy breakfasts, getting dressed and doing hair and makeup, it can definitely feel overwhelming at first. That's because you're giving yourself too many decisions, too early in the morning. You can only make so many decisions in a day before you exhaust yourself, so eliminating the early morning decisions will leave you with more energy throughout the day and turn your morning routine into a mindless (good!) habit instead of a checklist to run through. Narrow down the choices in whatever category is stressing you out - that may mean decluttering an extensive makeup collection, coming up with a list of go to meals your family likes and planning a week at a time from that list, or creating outfits ahead of time to choose from each day. Make the actual routine. I consider a morning routine the things I need and want to get done within the first hour or two of my day, that's it, and I focus on the things that will set me up for a successful day. I find it's most helpful to limit this to 3 to 5 main things, just like the before bed habits. Even if I don't get all of my things done every day, at least it's better than having no plan at all and getting the day started stressed out. Wake up at around 5:00 to 5:30. It's earlier on firehouse days, later on the days when John's off work or working on his other job. If John's not working, I'll sometimes push my wake up time to 6:00 and it's lovely. Make coffee and John's breakfast. Mainly just heating up breakfast that's already been prepared. (I generally eat at the office because I'm not hungry in the mornings.) I also take this time to prep anything that's necessary for that night's dinner. Most meal prep, all of the chopping and marinating and such, is done on the weekends, but occasionally I need to thaw meat or throw ingredients into a crock pot. Exercise for 15 to 20 minutes. Sometimes this is walking the dog longer than normal, sometimes it's just on the treadmill. It depends on her morning mood and the weather. Do my hair, makeup, and get dressed. I have a few go to hair styles, a capsule makeup collection, and a minimalist wardrobe, so there's no decision fatigue here. Finish some quick cleaning tasks. Every morning I clean up the kitchen from breakfast by unloading and loading the dishwasher as needed (we don't run it daily) and wiping the counters. I also wipe down both bathrooms, at least the counters, sinks, and mirrors. If necessary, I set the robot vacuum to run downstairs. Make changes to the routine when you fail. If you're starting a new morning routine altogether, you'll definitely need to make small changes along the way until you figure out what works according to your priorities. There will likely always be changes to be made - it's meant to be a routine that serves you, not a rigid burden that never evolves. So if something isn't working, take some time to figure out why, and make minor changes accordingly. Don't scrap the whole idea of a morning routine though, it takes a few weeks for habits to form, good or bad. There's no such thing as a perfect morning routine, because there's always going to be interruptions and problems. But I think having a morning routine will still help you stay on track when you wake up to things like a sick dog or a broken water heater. I find myself having much less stressful and much more productive days when I closely follow my ideal morning routine.